Welcome to R-ACT Theatre Productions! We are a community theater in the heart of Beaver County, PA since 1992! Check out what we have coming on the stage in 2019! Build the Segriff Stage Day! We will be building the Segriff Stage all day. Stop by for an hour or two and lend a helping hand! We will be putting up plywood and painting it all. Bring gloves, working clothes and a friend! Not very far...just down the block, we are staying in Rochester! We are actively working on relocating our upcoming productions as we prepare our new space. We just ask that you remain patient as we maneuver through the next few months! No donation is too small, every little bit will help us in our mission. Please check for updates on our progress. Stay tuned for information on changes and opportunities for call to action events. Thank you in advance for Keeping the Arts Alive in Beaver County! Doors open at 6pm. Show begins at 7pm. Concessions and 50/50 raffle. Sister Elizabeth Donderstock is Squeamish, has been her whole life. She makes cheese balls (traditional and smoky) that sustain the existence of her entire religious community, Clusterhaven. However, she feels unappreciated among her Squeamish brethren, and she decides to try her luck in the outside world. Along the way, she meets a Cockney-speaking Ukrainian immigrant couple who find her a job waiting tables at Plymouth Crock, a family restaurant run almost entirely by recovering alcoholics. The alcoholics love her. The customers love her. Her Danderfrock fits right in. Things are going great for Liz, until she's offered a promotion to manager. Unfortunately, Liz has a sweating problem, and to get the job, she'll have to fix it. Meanwhile, back at Clusterhaven, Liz's compatriots just can't seem to duplicate her cheese ball recipe, and it's going to cost them their quaint, cloistered lifestyle. They are panic-stricken and desperate, and sure she sabotaged the recipe. Does Liz go through with the operation? Can the Squeamish be saved? Will the cheese balls ever taste good again? The answers to these and so many other questions can be found in the new comedy from the Talent Family, David and Amy Sedaris. It is 1193, and Richard the Lionheart, King of England, has been captured on his way home from the Crusades and is being held prisoner. His ransom has been stolen and its couriers murdered. Who could have performed such a crime, a crime that would keep England’s king a captive when she needs him most? Was it his hypochondriac brother, Prince John, who wants the throne of England for himself? Was it Robin of Loxley, the dashing outlaw known as Robin Hood, who may want more power for himself? Could it be Robin’s right hand man, Little John, who is tired of living in Robin Hood’s shadow and wants to turn the spotlight on himself? Maybe it was Wilma Scarlet, Merry Woman and medieval feminist who wants more rights for women? Or was it the Lady Marion Fitzwalter, King Richard’s ward and a woman who is tired of having decisions made for her? Perhaps it was Maid Marion’s gentlewoman, the Lady Audrey, a woman who collects secrets as some people collect stamps? Could it have been Eleanor of Aquitaine, the powerful Queen Mother who loves her power? Is the fat Franciscan, Friar Tuck, a suspect or a detective? And who is that mysterious man wearing the red cross of a Crusader? A Lux Presents Hollywood radio adaptation. Louisa May Alcott’s story of the March sisters, Meg, Jo, Amy, and Beth, as they grow up during the American Civil War. This adaptation begins on Christmas, and the story is a well-loved American classic. 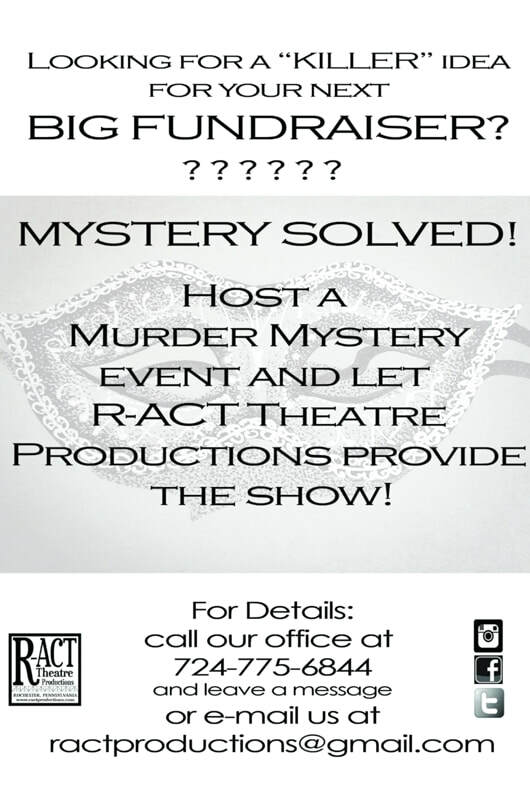 Hire R-ACT for your next fundraiser! You provide the venue and the dinner and we provide the show! Viola! A dinner theater fundraiser for your church, youth group, humane society, individual, athlete or sports club or community group. Available in Beaver County, PA and the Greater Pittsburgh areas of Allegheny County, Butler County and Lawrence County. What a great fundraiser idea! Archives: The Broken Leg Gallery..
sign up for the r-act newsletter..